The meaning of the four suits. How numerical value relates to each card’s meaning, and how consecutive cards in a suit interact with each other. 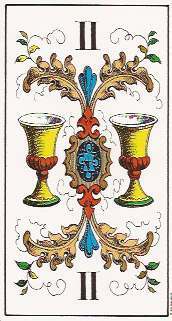 Techniques for extending the cards’ meanings with color, number and elemental symbolism. Ways to deepen your connection to the cards by paying careful attention to the image. How to add layers of meaning using numerology, the four elements and color symbolism. Get the most out of this section by having a notebook handy with a page dedicated to each card. When you’re done, you’ll have a list of associations and key words you can use as raw data for brainstorming your own uniquely personal meaning for each card. Lay out four cards of one suit in a row. Have a mixture of odd and even numbered cards, and be sure to include the ace. Make a row for each suit. Take notes as you study the cards using the suggestions below. When you’re done you should have enough data to draw up a profile of each suit. What exactly is being depicted in each suit? What kind of cup – religious chalice, drinking cup, ceremonial? Are the rods fancy ceremonial staffs, cudgels, or work tools? Do the swords look like weapons, decorative hangings, or war trophies? Who would use these items? In what setting or situation? To what purpose? The Aces announce what kind of energy is in play. The suit symbol on the ace is usually different from the rest of cards. Describe the suit based solely on the Ace. Which suit feels the most open, most closed? Most active and most passive? Which suit is the straightest, the roundest? Which suits combine these qualities? Where is the center of gravity? Is it in the center of each card, or do some suits have multiple centers? Is it in the suit symbol itself or the decoration surrounding the suit symbols? Which suit has the most vegetation? The least? Does any suit have abstract decorations instead of vegetation? Use your notes as raw material to draw up a profile for each suit. Re-write the profile in the first person as if the suit were a conscious entity. Make a list of keywords for each suit and write them on four index cards to be used in a later exercise. Lay out one suit in a row from ace to ten. Run your eyes over the progression. Notice how the odd and even cards alternate, and how the tone changes as more suit symbols are added. As you work through the suggestions below, jot down some descriptive adjectives for each card in your notebook. What does it mean to have a large or a small amount of the suit symbols? Compare the Two and Eight of one suit. Does Two feel light, fragile, flexible, tentative, or weak? Is Eight heavy, inert, complex, or powerful? There’s no right or wrong answer – you’re starting to develop your own vocabulary for describing the cards. Put a variety of high and low cards from the same suit next to each other and get a feeling for each card based on the amount of suit symbols. Make a value judgment. How does it feel to have only a few swords, or a lot of cups? Is it good to have a lot of swords or rods? Do you get a feeling of insufficiency or over-abundance from some cards? Do the higher numbered cards overwhelm the smaller cards or offer them support and protection? What’s the difference between the odd and even numbered cards in a suit? Where is the odd suit symbol placed? What function does it seem to have? Are even numbered cards symmetrical and formal? Stagnant? Solid? Do certain cards feel dynamic or on the brink of change? Look at each card in the context of its surrounding cards. What’s its relationship to the preceding card? Is it emerging from it, pulling away from it, trying to distance itself from it or being drawn back to it? What is its relationship to the card that follows? Moving toward it, striving for it, being forced to change to accommodate it? Make up a story about the drama or the struggle the card is undergoing as it interacts with its neighbors. Does your story suggest possible card meanings? 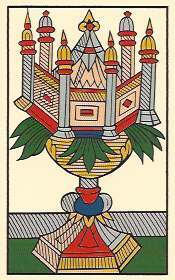 The heart and soul of Tarot is a close examination of visual details. If you look long and deeply at the imagery, the cards will speak to you in their own language. 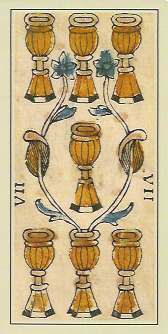 Most historic decks have stylized leaves, flowers, or other ornamentation on the pip cards which can be a great help in discerning the meaning of a card. Here are some things to keep in mind while looking at the cards. As you look at each card, make notes on how your observations can translate into card meanings. How does the ornamentation or vegetation channel the interaction of the suit symbols? Does it bind the suit symbols together? Separate them? Enfold them protectively? Support them? Pick one out as a focus? Does the vegetation or ornamentation form pathways or enclosures, or make shapes like hearts or arrows? Does each suit have a different type of ornamentation? Do some suits have abstract ornamentation instead of vegetation? Are the flowers budding, mature, or past their prime? Are there seed pods? Do the leaves droop or twist in a certain direction? Are they robust or delicate? Can you identify ivy, roses, or lilies? Are some cards in a suit plain, with no ornamentation? Are all the cards in a suit above a certain number without ornamentation? Does this have implications for the story the suit is telling? 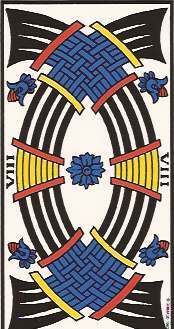 Is the ornamentation in your deck extremely stylized? Can you read meaning into the ornamentation, or is it just decorative? Are the odd- or even-numbered cards ornamented in a characteristic way? What does this say about their differences? 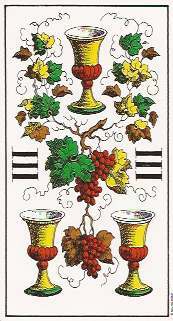 Is a certain motif repeated in several cards, like a distinctive flower, or heart-shaped vines? How does this connect the two cards? Are their meanings related? 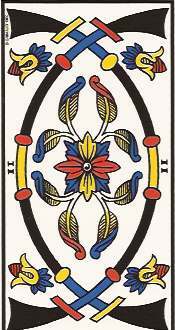 Do some cards contain extra embellishments like a shield, animal, cherub, or motto? How can it add to the card’s meaning? On the next page you’ll learn how to add even more layers of meaning to the pip cards.